So, you’ve picked up your first pair of roller skates and are trying your skill around the rink. Or, maybe you’ve been skating for a while but want to improve your roller skating skills. Either way, the tips below are for both beginners and intermediate skaters. These tips will help you out-race your friends around the Skate Moore rink in no time! Check out our hours of operation and prices, and come skate with us today! Many people opt out of wearing protective roller skating gear because they don’t want to look silly. However, this gear can save you a trip to the emergency room and broken bones! It doesn’t matter if you’re new to roller skating or you’ve been roller skating for a while, falls can happen. To stay safe, wear a helmet, thick kneepads, elbow pads, and wrist guards. 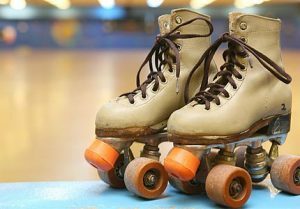 Learn how to roller skate from a trained professional. Roller skating classes are great to learn the basics and receive tips on technique and style. When you’re at Skate Moore and have questions about roller skating, ask our staff. They can teach basic skating skills to anyone who needs help!